Dry Out In The Forecast! After we get through tomorrow, it looks like no rain in the forecast for at least five days! Yeah! 30% chance of rain yesterday, and I drove to work in that 30% chance! Anyway, it looks like clear skies are ahead and wonderful temperatures…..80s. This is August!!! We have had non-stop generation (other than a shut down for a couple hours turing the Hollister flooding) since the 5th of August. Thursday at 4:00 p.m. they opened up five flood gates. They are not opened very much, but enough that you know we have extra water coming down the river. If I heard correctly, they are trying to maintain a total of around 20,000 cfs which includes what is coming over the flood gates plus the generators. Table Rock Lake is currently at 919.4 feet elevation. Good news, we have had boats on the river and fishing is not bad. As a matter of fact, under the conditions, it is pretty darn good. The day before the gates opened, but with three units going, Carolyn had Kristi, from Oklahoma on the river for the day. Beautiful weather, lots of water and fishing was good. 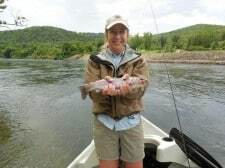 Most of Kristi’s fish were caught on a size 16 black tunghead midge dropped under a peach king egg pattern. She did catch a few stripping a black sculpzilla. Stan and Jim braved the five flood gates on Friday. Good day for everyone. Jim had Randal from Kansas out for the morning. Randal is a fairly new fly fisher, but is certainly catching on quickly. Good day for this young man on the size 12 ruby with either a brown San Juan of rusty midge dropper. Stan had Dave and his nephew, Tyler. Both these guys are seasoned fishers and they did well on the peach egg, big ruby and stripping either a 76er or holographic green crackleback. This entry was posted on Monday, August 12th, 2013 at 8:42 am	and is filed under Fishing Reports. You can follow any responses to this entry through the RSS 2.0 feed. You can leave a response, or trackback from your own site.